Copyright 2011 Taylor & Francis. 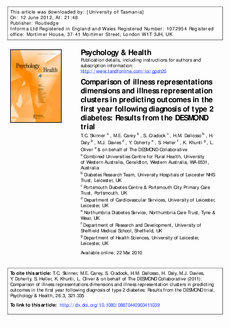 This article explores the utility of cluster analysis of illness representations, in comparison to analysing each dimension of the individual's illness representation, to predict an individual's response to diagnosis of type 2 diabetes. Participants in a large multi-centre randomised controlled trial of a self-management education intervention for people with type 2 diabetes, completed measures of illness beliefs (coherence, timeline, impact, seriousness, personal responsibility) and depression along with HbA1c and body mass index (BMI), at baseline 4, 8 and 12 months. The results of the cluster analysis were compared with an independent qualitative study of participants' responses to diagnosis and participation in the study. The quantitative analysis of 564 participants for whom complete data were available, identified four clusters of illness representations as the most parsimonious description of the data. The mean profiles of these clusters were comparable with groups identified by the independent qualitative analysis, and predicted the trajectory of illness outcomes over the 1-year follow-up. Combining illness beliefs into discrete clusters may be more useful in understanding patterns of responding to illness than using analysis of illness beliefs dimensions independently. © 2011 Taylor & Francis.